These simple, yet effective homemade face moisturizer recipes are cost-effective and gentle on your skin. I am sharing my best recipes here with you as dry skin remedies. Using only natural ingredients, these organic moisturizers are free from parabens and other nasty chemicals. These creams will rehydrate your skin, and restore the lipid functioning barrier, giving you a smoother and more radiant complexion. Because many of these recipes should be kept for just a short time and refrigerated, it is best to make small quantities rather than large batches that will spoil before you have used them. A good moisturizer should leave your skin feeling soft and radiant, without feeling greasy. oil on their faces. It is great to remove eye make-up and foundation. 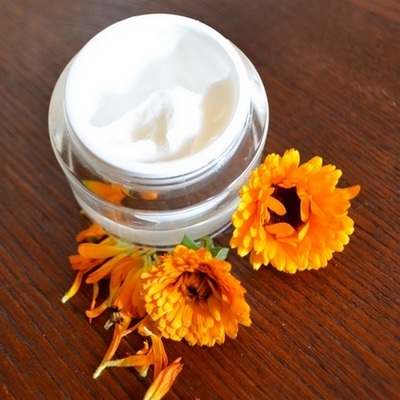 This homemade moisturizing cream is wonderful for dry to normal skin. The tincture of benzoin can be obtained from the drug store and is a natural preservative. If you want to, you can leave it out, but make sure that you use this cream quickly. Place the oils and beeswax together in a glass bowl and place in a hot water bath. When all the ingredients have melted together remove from the heat. Add the orange flower water and benzoin and beat vigorously until cool and solidified into a cream. Place in a jar, cover and refrigerate. anti-wrinkle cream too. When you get to my age, every bit counts! Make the calendula tea first. Strip off the petals and place in a cup and pack it as much as possible with the petals. Pour over boiling hot water and allow to steep for an hour. Squeeze all the moisture out of the petals while removing them from the water. You want all those essential oils in your cream, so make sure that when you are squeezing them dry you are collecting this in your cup. Now place the beeswax in a double boiler and add the almond oil. Melt the wax over low heat, stirring constantly to combine the ingredients. Take off the heat and dissolve the borax in the calendula tea and slowly pour it into the melted wax and oil, whisking constantly. It will turn milky and thicken, continue whisking while it cools. When it reaches thick pouring consistency, pour into glass jars or china pots. Makes 7 oz. Fruit, milk, honey and eggs can be found in almost every kitchen, and there are so many foods that make simple, organic moisturizing preparations that feed your skin. Here are a couple of dry skin remedies that spring to mind. When using fruit make sure that is very ripe, as this is when it is full of goodness and vitamins that will feed the skin, as you want it to. When applying your moisturizer, make sure that you apply it in upward strokes so as not to drag the facial muscles down, and always apply the mixture to your neck as well. Blend together I ripe peach and 1 cup heavy cream. Refrigerate. Massage onto your skin wherever needed once per day. This is a nourishing moisturizer for dry skin. With this beauty recipe, the egg nourishes the skin and the milk balances the pH levels, leaving your skin plump and soft. This is a good moisturizer for dry or aging skins. Beat 1 egg yolk into 1 cup of whole milk. Apply to face with fingertips. Bottle and store any remainder in the fridge. Do not keep longer than 3 days. Mix the three ingredients together and then apply to face and neck, avoiding eye area and mouth. Leave on for 10 to 15 minutes and then rinse off thoroughly with tepid water.